The investigating officer determining whether three U.S. 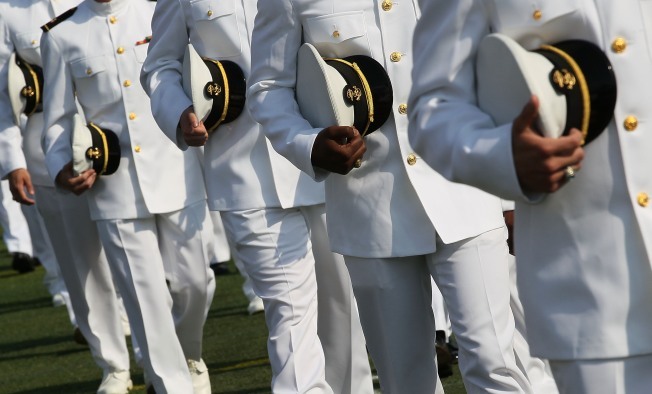 Naval Academy midshipmen should be court-martialed on sexual assault charges is allowing the accuser's medical records to be considered. Attorneys for the three former football players said Wednesday that the records should be part of the Article 32 hearing. Cmdr. Robert Monahan moved forward with the hearing, allowing the records. But he then closed the hearing again to consider the relevance of the female midshipman's sexual behavior. The woman's attorney, Susan Burke, had argued that information in the records date to before the alleged assault last year at an off-campus house in Annapolis, Md., and should not be admissible. The hearing resumed Wednesday afternoon. Midshipman Josh Tate, Eric Graham and Tra'ves Bush are charged with sexually assaulting the woman in 2012.